Five outcasts face a terrible evil. Can they drive the darkness back? Dark, hypnotic and shrieking with suspense, Anthony Horowitz’s acclaimed horror series is simply unstoppable! 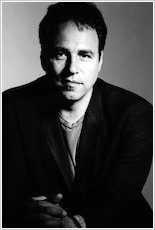 Anthony Horowitz answers your questions! Ten Scholastic Book Club members posed their winning questions to Alex Rider author Anthony Horowitz. Here’s what he had to say! He never died, Fatimah. He was just very badly hurt. I wasn’t a superstar, Holly – although English was my favourite subject. I just loved writing… so that’s what I did. Great question, Sollomon! I think all the books by Philip Ardagh are pretty strange. This is a wonderful question, Tom. The answer of course is not to ask your parents in the first place, but don’t say I said so – and take care. Alex has adventures, but tries to avoid danger. Not very much, actually. I still spend a lot of time on my own in a room, writing. But it is fun selling so many books and questions likes this certainly keep me cheerful. I still have it. It sits by my desk and reminds me that life is short… I need to get a move on with that next chapter! 1. What gave you the inspiration for Alex Rider and what makes you want to keep writing about him? When I was younger I loved the early James Bond films. I thought Sean Connery was great but Roger Moore… well, to me he looked too old to be cool and I thought – what if James Bond was young? Every school I went into I asked children to give me names for the coolest hero and the name that came out top was Alex. Then I thought back to James Bond and wondered … if JB had a son who would be the mother? To my mind, it would have to be Honey Rider, so my hero became Alex Rider! Creating Alex was like meeting my very best friend for the first time and each book I write I have such fun meeting up with him again. I still have lots of ideas and the more I get to know him the more I want to write about him. 2. You’ve admitted you like thinking of ways of killing people off – is that what children like reading about? Everyone enjoys a fanciful death. The enjoyment of the James Bond films is in proportion with the ingeniousness of the death – I haven’t stop smiling ever since Gold Finger got sucked through that aeroplane window! 3. Who do you like best – the goodies or the baddies? The baddies are much more fun to create, but Alex is my favourite character, and he’s good! I really enjoyed creating the baddie in Snakehead – Winston Yu. He is a frail old man and I based the look of him on Andy Warhol, and gave him the best death ever! I’m thinking about writing a book entirely about Yassen, the baddie in the first four Alex Rider books. It will be about how he became an assassin when he was 14 and how it turned him into the man he was, with no redeeming qualities. 4. We know you take your research seriously, from going underground at Wimbledon for Skeleton Key to driving a crane for Point Blanc. What did you have to do for Snakehead? It was great fun driving that crane – but it had all the workmen diving for cover! For Snakehead I explored an oil rig outside Aberdeen, ventured into Outback Australia, spent hours wandering around Bangkok – including some very dodgy areas along the river – and went kick boxing in Thailand. 5. Part of the appeal of the Alex Rider series is the gadgets – what’s your favourite? What’s your favourite boys’ toy in real life? My favourite gadget is the exploding bubble gum in Skeleton Key, I loved its name: Bubble 07! I also rather like the insect lotion in Archangel which attracts insects rather than repelling them. I have to say I’m not very fond of all these modern technological gadgets, my favourite things are usually antiquated and made of wood. For inspiration for Alex Rider’s gadgets I have to sneak into my sons’ bedrooms and see what they’ve got lying around. 6. You’ve said that you hated your boarding school and you’ve had your revenge on some of your teachers by turning them into fictional characters. How did your school days shape you? If you had to go back to school today what would you want it to be like? My school days were traumatic and unpleasant. At school, books were my lifeline and writing stories was my escape. I’ve been writing ever since, so perhaps I should be grateful to my boarding school, Orley Farm – but I’m not. If I was to go back to school today I’d like it to be like my son’s school: with girls and no beatings or abuse by teachers and where I wouldn’t have to live in fear. 7. Now that Alex is star of the screen do you think we need to read the books? Well, so far there’s only one film and there are seven books! Films can never excite you or move you in the way that books can. When you’re reading the book it’s like you’re the one making the film, and that’s much more fun. 8. The Power of Five series contains horror. Why do you think we like reading things that scare us? Does anything scare you? Fear can be a fun emotion if you know that you’re safe, so reading horror in a book is just a tingling, it’s not real fear. The thought of dying when I’m in the middle of writing a book is what scares me! 9. The Diamond Brothers series features the useless dim Tim and bright spark younger brother Nick. There is lots of humour in these books – is this where you have the most fun? I do love creating lots of crazy new jokes for these books, and often embarrass myself by laughing out loud in public when I’m thinking them up. They are great fun to revisit. He has travelled to all the places in the Tintin books (except the moon). He takes research for his books very seriously. He has walked across the Andes and visited the Forbidden City in Hong Kong. For Point Blanc, he climbed and operated a 150m crane opposite the Houses of Parliament. He got married in Hong Kong. He didn’t understand the ceremony because it was in Chinese. He spent a year working as a cowboy in Australia. This was for fun – not for a book. His passion is scuba-diving. He has dived all over the world, including Sipadan in the South China Sea, where he saw hammerhead sharks.